As national teams and spectators return home to reflect on their respective results one of the world’s largest sporting events, young people everywhere are fostering their dreams of following in their sporting heroes’ footsteps. 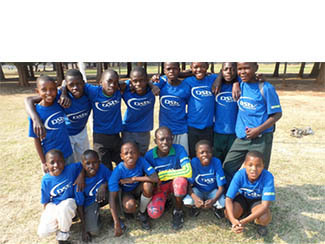 At the Ponesai Vanhu Junior School in Zimbabwe for vulnerable children, two bright young men are one step closer to their personal dreams of playing for their national soccer team. Dudzai Chimusasa is a striker on the school’s senior football team. In addition to the school team, he also plays on the Shingirirai, Black Nugget and Montana club teams in Chitungwiza. Last year, he had the opportunity to represent the Zimbabwe under17 six-a-side team at the International Orphan and Vulnerable Children’s Sport Festival in Poland. Dudzai began at Ponesai Vanhu Junior in 2010, after his parents passed away. He is currently completing From 3 at secondary school. His football hero is Lionel Messi, and he has the most fun playing when he scores goals for his team, as well as when he learns new skills from others to improve his game. The tournament is run by the Hope for the Euro Association in Poland, with the aim of empowering children from disadvantaged backgrounds to follow their dreams. The initiative began within Poland, organizing a tournament for regional teams made up of children living in homes for vulnerable children. In 2010 the idea became so popular that the tournament went international, and they now host a “World Cup” for children representing over 20 different countries each year. Dudzai says the hardest thing about the experience was communicating with players from other countries due to language differences. However, in addition to the fantastic life lessons he learned through the experience, he will be able to help one of his class mates prepare for the experience this year. The school’s Junior team goalie, Tinotemna Guvheya has also been selected to represent Zimbabwe in this year’s tournament at the end of this month.